Who loves the taste and texture of grilled cheese sandwiches? How about vegan grilled cheese sandwiched? Better yet, how about a great vegan grilled cheese sandwich recipe with crisp, salty, vegan coconut bacon on it? If you think you can’t even imagine it, you are right. When did vegan food become this amazing? How do I even describe how incredible this sandwich is? First of all this vegan grilled cheese coconut bacon sandwich is completely vegan. Despite the name it is meat, cheese and dairy free and it is amazing. There is no cheese or bacon but there are some very creative vegan substitutes and they will blow you away. For starters you will learn how to make incredible coconut bacon. These tasty little chips are great in a variety of recipes but they especially shine through on this sandwich. There is also some Kimchi involved so you will be getting some nice digestive enzymes. I never had any idea a grilled cheese sandwich could have health promoting qualities like this vegan grilled cheese does. For many people just the sound of the words “grilled cheese sandwich” are enough to make you salivate. Since you are reading this article I suspect you may be one of those people. And this sandwich really delivers. 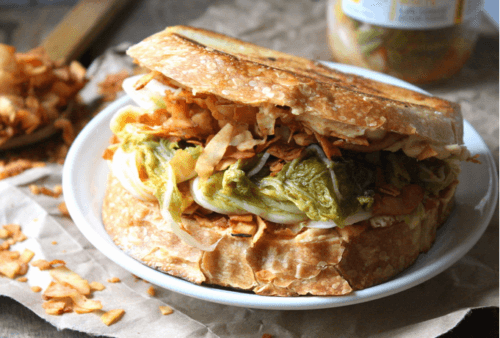 From the smokey sweet flavor of the coconut bacon chips to the melty cheesy goodness I give this vegan sandwich a 10. Fettle Vegan created this easy vegan cheese recipe and provided the great pics too. 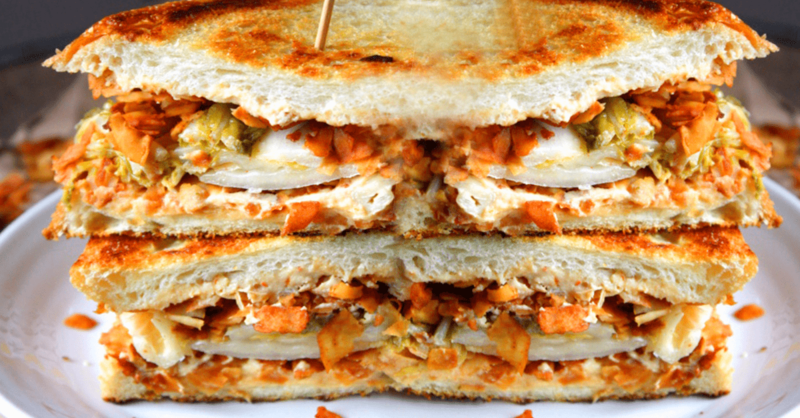 You can learn how to make this great vegan grilled cheese sandwich by clicking here. who else loves it ? This is pretty cool… Thanks I am going to share it with my followers! Didn’t show me how to make the bacon?